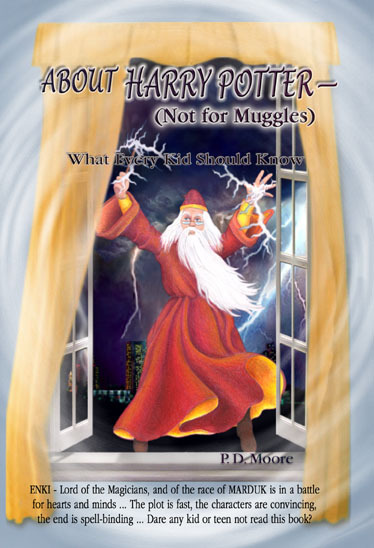 ABOUT HARRY POTTER (not for muggles)what every kid should know...ISBN 0-9543596-3-1. ABOUT HARRY POTTER - what every kid should know. This is an allegory of the history of a ‘special’ race of people who have fallen under a powerful ‘Curse’. As a result they have lost a sense of their true identity and original destiny. It’s a true story where the real blends with the imaginary, making it seem all so immediate and personal. True stories, supernatural encounters, and experiences are shared in the lives of six fictional characters and other characters not so imaginary. P.D. Moore depicts, in this compelling narrative, how virtually the entire race of Salem have succumbed to the powerful enchantments of a supernatural being called ENKI - the Lord of Darkness and of the Council of Evil. Having brought almost the entire race under the ‘Curse’, the fiend ENKI now claims this earth as his fief. Through his legion of nimbuses and their djinns (or gins), he employs subtle and powerful strategies to maintain and extend his control over the minds of mortal beings. Apart from a relatively small number who have managed to resist or escape ENKI’s spell, all have fallen into his Matrix of delusions and self-deceptions, so that now they aren’t even aware of their true condition. They have even forgotten the name of their true Lord. It seems that the race is destined to remain ENKI’s willing ‘slaves’, forever. That is until a great being came up with a clever plan to break the ‘Curse’ and redeem them from ENKI’s control over their minds. Some have faithfully followed this plan and by so doing have escaped ENKI’s snares and the mysterious ‘Curse’, that keeps them under his powerful spells. However, most are so enchanted by ENKI’s spell that they unable to recognise the presence of the hypnotic power over them or that they are in rebellion against the great being ‘I AM’. This is the case for all who fall under the ‘Curse’ – they become caught up in a Matrix of delusions. Their only hope now lies in the writings of an ancient, almost forgotten book, that in olden times offered guidance to that ‘special’ race. But the deceptive strategies of ENKI have always, for the most part, been very well concealed. He has led them to either forget or ignore the book. One of ENKI’s main strategies has been to use a people called the MURDUKs, the direct bloodline of those who have rebelled against the great being, to ensnare the ‘chosen’ race of Salem. Chosen, not in the sense of being better than others, but chosen to keep the name and knowledge of the great being alive on the earth. Until the deception of their ancestors into the service of ENKI the people of MURDUK had a proud and noble ancestry, from which the young man called Harry had descended. The great being – also called ‘I AM’ and King of Salem, was the creator of all life, including the chosen race. It was from this race that the MURDUKs had their lineage, but as a result of their fall into a matrix of deceptive enchantments they have become transformed into MURDUKs - agents of the evil ENKI. The people of Salem are the only ones left from the chosen race that have not given their allegiance to ENKI and still remain faithful to the great ‘I AM’ and his Son Emman. And it is for that reason that the children and young people of Salem are made the special target of ENKI’s deceptions and concealed hatred. If he could win them over to his cause, or instil his values in their minds while they are young, he would most certainly gain control over the entire race of Salem, as he has over the people of MURDUK. Thus the children and young people of the race of Salem require special protection in the form of powerful supernatural beings, called Seraphs. These special forces are needed to protect the children of Salem from the evil charms and spells of the nimbuses and gins, who work through the people of MURDUK. Although the latter are close descendants and often blood relatives of the race of Salem, they have allowed themselves to succumb to ENKI’s powerful spell of self-delusion and are now his ‘mindless’ slaves. This condition of self-delusion, they are led to believe, is the highest state of enlightenment. ENKI also secretly known as Ek-Onm-Kar, the Lord of Darkness, and the Evil One, wants them to think he doesn’t really exist and, that everything they do are of their own free will. There are other names given to ENKI, but those are only used by those who wish to conjure or invoke his dark powers. This book is an account of the lives of the modern day descendants of Salem, in their constant struggle to resist the subtle strategies of their sister ‘race’ – the people of MURDUK. They must also avoid the deceptions of the invisible nimbuses and gins, if they are to stay free of the power of the evil ENKI, who seeks to bring all humans under his mesmeric enchantments and delusions, as he did to the people of MURDUK. But all is not lost. As a result of the work of one of the Seraphs, sent by the great being, there has been a spiritual awakening and rediscovery of the ways of ‘I AM’. This comes about as a result of the revelations of an ancient book called, The Book of Knowledge. One of the leading lights in this spiritual rediscovery and revolution is an unlikely source; none other than the boy formerly known by the surname, Potter. Harry too had fallen under ENKI’s spell until things changed dramatically when he discovers, to his surprise, that the real reason his father and mother were killed by the ‘Evil One’, ENKI, was because they had discovered something in a book that would free the mind from the spell of ENKI’s alluring enchantments and his powerful delusion - the Curse of ‘enlightenment’. Harry is determined to free himself of the ‘Curse’. If only he could get hold of this book, he would be able to read the words himself and so escape the power of ENKI. He could then use this knowledge to help other young people escape and avoid ENKI’s deceptions. But ENKI, the Lord of Darkness, is a master of deception, and has assigned three powerful and invisible ‘entities’ to further his cause and oversee this work on young minds: Matrix (secretly known as Self- determination), DESIRE (aka ERISED), and Enlightenment (alias the ‘Curse’). These three agents of ENKI do their work of deception through an army of invisible beings called nimbuses and a lower order called the gins. These are really evil mutants of more powerful beings called, Seraphs. The greatest weapon of the mutants, however, is their anonymity. The nimbuses and gins also employ the MURDUKs, to befriend and mislead the children of Salem. To defeat these unseen and subtle forces the great being, ‘I AM’, has commanded the three most powerful celestial beings of his entire supernatural realm to guide, support and protect his followers and, to help the ‘slaves’ of ENKI who wish to escape the powers of the dark lord. The supernatural beings of wisdom and light are called: ‘Revelation’, ‘Deliverance’, and ‘Shield’. These three beings are of the order of the Seraphs, and although invisible, are always present, working around the clock to expose ENKI’s deceptions on young minds. Will they succeed in their mission? Will Mark, Harry’s cousin, and his new friends be able to persuade Roger to take their discoveries seriously? How will Harry respond when he reads the wisdom from The Book of Knowledge; and what will ENKI do? There is everything to play for and a lot to lose! It all begins one summer with Jacky Hernandez and her haunted house, in a place called Enfield, near north London. This leads to a chance encounter with Harry’s cousin, Mark, and Jacky’s slightly older teenage friend, Roger Spencer - an avid fan of the supernatural and magick. And then there is Jacky’s cousin, Barry – a psychic, or paranormal investigator, who, like James Randi, thinks that all paranormal manifestations are hoccus poccus. That is until he makes some surprising discoveries. Jacky on the other hand, initially, is neither betwixt nor between. There is some romance too, as Barry meets his match in Sophie Ash, a white witch from Milton Keynes. The tension between Tim, Jacky’s neighbour, and Roger is palpable. The two can never agree. Roger is of the Order Of The Black Circle. You see magickal folk and muggles do not see eye to eye. And so when Tim announces he is to go on holiday, Roger is clearly relieved. Rogers’ world is not for Muggles. But Tim’s departure only gives Roger a short brief reprieve, as the plot thickens taking a very unexpected turn, after Mark Potter and, then Harry himself enters the scene. Conveyed in simple but evocative prose, this book is a must for all magickal folks, young people and kids interested in the power of magick. Muggles be warned! NOTE: There is normally a 3-4 days delivery time.